Located on the eastern edge of the Napa Valley overlooking Lake Hennessey and the town of Rutherford, this extraordinary mountaintop estate features a rich and diverse small portfolio of exceptional wines. Your Premiere Napa Valley Estate Cabernet Sauvignon is a true representation of the Kuleto Estate. This wine is full of fresh fruit and spiciness, displaying a pure and bright hue in the glass. In the mouth it is compact, fresh and energetic. The Estate Cabernet is aged for 25 months in 100% new French oak barrels. Purists covet hillside-grown grapes for one simple truth: the mountain fruit that grows under these exacting and stressful conditions finds its rewards in grapes of incomparable concentration and complexity - and the Kuleto Estate Cabernet is no exception. This powerful yet balanced and elegant wine is a distinctive interpretation of the estate on which the grapes are grown. In 1986 Dave received his masters degree in enology from the University of California, Davis. After university he was hired as enologist at Robert Pecota, where he further refined his technical and artistic capabilities before taking a hands-on position as cellar master at Storybook Mountain. In late 1987, Dave rejoined Acacia as enologist where he quickly made himself indispensable. Passionate and committed, Dave was promoted to winemaker in 1992, then to general manager/winemaker in 1997. Resolved to maintain his relationship with both the wine and the vine, Dave left Acacia in 1998 after eleven years of dedicated service. 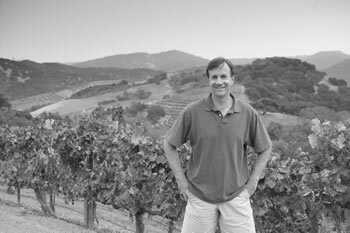 Together with his wife Kendra, a trained enologist and landscape architect who has worked for several top California wineries, Dave founded CL Wines, a consulting and winemaking business. Education: In 1986 Dave received his masters degree in enology from the University of California, Davis. Making wine at Kuleto Estate is about quality of life and a deep relationship with a remarkable piece of land. 2019 © Napa Valley Vintners All Rights Reserved.